A set of curious researchers, state-of-the-art visual technology and a bit of good luck helped find a new fish whose tooth collection could put a shark to shame. 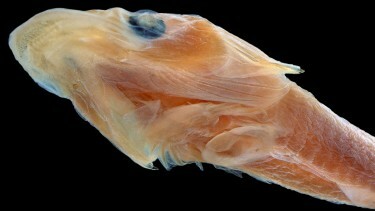 Scientists at the University of Washington, Texas A&M University and the Western Australian Museum have discovered and named a new genus and species of clingfish after stumbling upon a specimen preserved in a jar dating back to the 1970s. The fish was unmistakably different from the other 160 known clingfishes, named for the disc on their bellies that can summon massive sticking power in wet, slimy environments. The researchers named the new species “duckbilled clingfish” (Nettorhamphos radula) for its broad, flat snout ― not unlike the bill of a duck ― that houses an impressive number of tiny, conical teeth. “This fish has characteristics we just haven’t seen before in other clingfish. 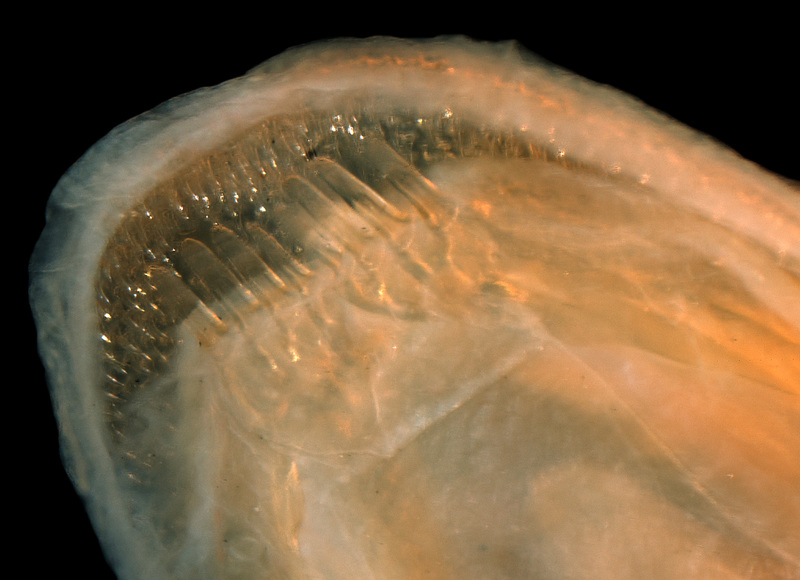 It’s the teeth that really gave away the fact that this is a new species,” said lead author Kevin Conway, a fish taxonomist and associate professor at Texas A&M University. A detailed description of the new genus and species was published April 14 in the journal Copeia. Scientists, including co-author Adam Summers of the University of Washington’s Friday Harbor Laboratories, are interested in clingfish for their ability to stick to rough surfaces. The finger-sized fish uses suction forces to hold up to 150 times its own body weight. Understanding the biomechanics of these fish could be useful in designing devices and instruments to be used in surgery, or to tag and track whales in the ocean. Conway and co-author Glenn Moore of Western Australian Museum discovered the new clingfish while looking through specimens preserved in jars at the museum in Welshpool, Australia. It’s common for unknown specimens collected during surveys to be registered and shelved until an expert has the time, and interest, to take a closer look. This specimen was caught off the coast of Southern Australia in 1977. Even though the fish is only as big as a pinky finger, its unique teeth structure caught their attention. A couple of hours later, Moore found yet another specimen with similar features on the museum shelves. Together, the specimens are thought to be the only two of this new species that exist out of water. The researchers suspected they had discovered a new species that represented a new genus of clingfish, given the unusual mouth structure and teeth arrangement, but they were faced with a conundrum: Naming a new species requires an intact, complete fish with good documentation of its morphology and clear distinctions from other species. With only two known specimens, dissection was out of the question. Instead they turned to Summers, who studies clingfish and is actively working to scan and digitize every fish species in the world using a computerized tomography (CT) scanner. Each completed scan is housed on Open Science Framework. Using the scanner, the scientists were able to capture even finer details of the new clingfish than would be possible through manual dissection. 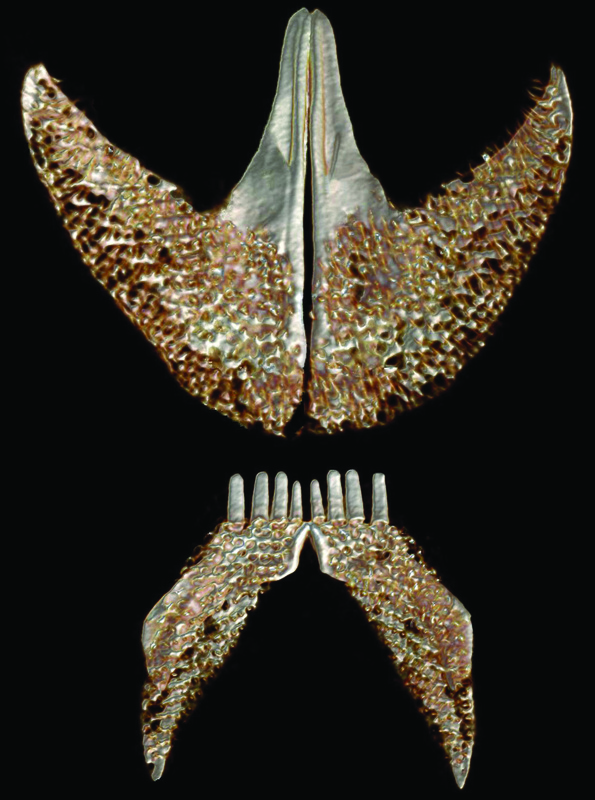 They also used the digital scans to 3-D print parts of the fish in larger-than-life size to be able to analyze the mouth and jaw structures. 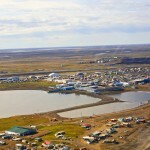 The scans allowed the researchers to hone in on the fish’s skeletal structure from many different angles and essentially digitally dissect parts of the fish. They estimate the tiny fish has between 1,800 to 2,300 individual teeth ― or 10 times what all other known clingfish have. The teeth point backward, which would suggest a gripping function, Conway said, but the researchers can’t be sure since the fish has never been observed in the wild. The duckbilled clingfish joins the ranks of hundreds of new fish species that are described each year. It’s more unusual for these new species to be placed into a new genus ― in this case, the fish’s wider and longer upper jaw and abundance of tiny, dagger-like conical teeth were the sure signs of a brand-new genus. The researchers are particularly pleased to have discovered a new clingfish in a region of Southern Australia that is known for its clingfish diversity and abundance. For more information, contact Summers at fishguy@uw.edu or 301-864-1491; Conway at kevin.conway@tamu.edu or 979-845-2620; and Moore at glenn.moore@museum.wa.gov.au or 61-8-9212-3744 (in Australia).